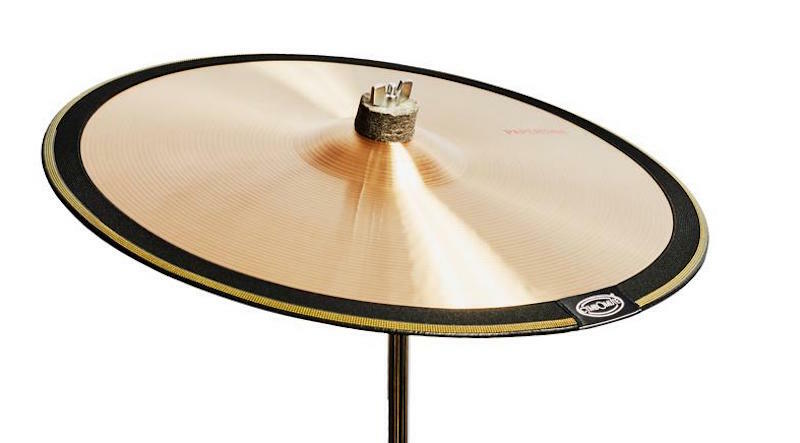 If you haven’t seen or heard of Cymbomutes, they are essentially an elastic material, designed to fit snugly over the edge of a cymbal and as such, bring its volume right down for quiet practise. I can confirm that on that front, they have always been pretty great and do exactly as described! One area they have had an issue with though is the durability. I have a student who uses them on his cymbals along with mesh heads, together they work rather well. The Cymbomutes do eventually wear through and need replacing though. I guess it’s inevitable really that a rough wooden drumstick crashing into and across a fabric will eventually wear through it. These new Cymbomutes though may have the answer, in the form of a silicone edge which absorbs the stick impact and protects the fabric beneath. I’ve had a little play and went at one on an 18” crash. It does feel like it’ll protect the fabric and prolong the life of the cymbal mute. How much longer it’ll last than the original design is anyone’s guess, but I’m certain it’ll be a lot longer. The big advantage of these mutes is that they are available in a range of sizes, with extra wide ones for ride cymbals and they don’t change the feel of the cymbal too much, which is a huge plus over solid rubber dampeners. Obviously as far as the sound goes, once they are fitted any and all cymbals sound like dustbin lids, but at least the neighbours won’t complain! 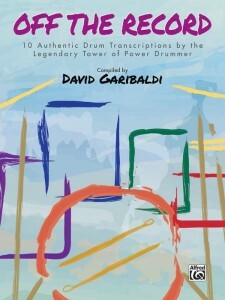 Off The Record, compiled by David Garibaldi, is a collection of 10 Tower of Power transcriptions, painstakingly written out by the man himself. The foreword of this book is a nice, honest account of what it has been like for Garibaldi whilst working on recordings and with the other members of TOP, I can see myself in some of what he has to say and instantly that hits home. If you tend to skip the foreword, this is one you shouldn’t. It contains the usual dynamic chart that his books feature, talking of the “two sound level” concept and a drum legend (drum key to us Brits) before getting stuck into the charts. One thing I really like about this book is the fact each song comes not just with a chart, but also an introduction to the piece. For the album East Bay Grease, leading into the chart for Knock Yourself Out, that also includes a bit of history as to how Garibaldi became the drummer for TOP. Having worked on Future Sounds and having played TOP tracks before, even in bands, I turned excitedly to one of my favourite tracks of all time, What is Hip? and very quickly discovered that my rough approximation of the track was indeed rough at best, and not even close at worst. Far from downtrodden, I was actually rather excited by this as the book presents not only a great set of tracks to play through, but also somewhat of a challenge. There is one downside with this book, and that is that each song is written out note for note in a jazz engraving, and that means lots of page turning. Other than that, it is a great release which could only be slightly better if there were backing tracks to accompany it. 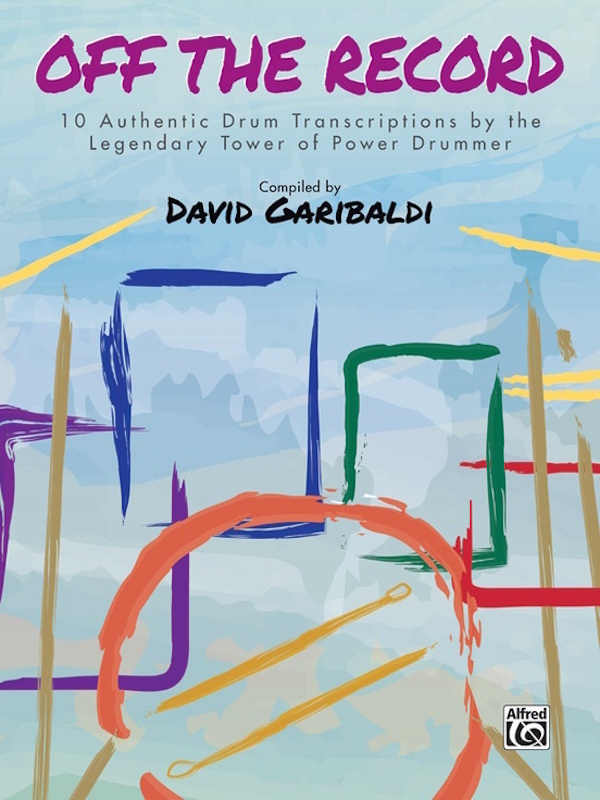 If you’re a fan of funk music, Tower of Power specifically, David Garibaldi, or if you just want a bit of a challenge, you should pick this one up. 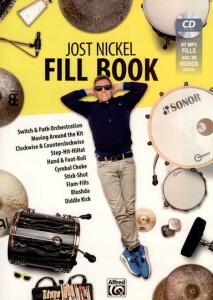 After a recent explosion in popularity and the huge success of his Groove Book, Jost Nickel is back with an accompanying Fill Book. Complete with a CD featuring audio examples and with video files available online, there is a wealth of ideas here to get you creative on the fills front. He begins by talking about how to approach this particular book but these are also great tips for practicing as a whole. I like his approach, it’s logical and helps you to see where you’re at and how you’re progressing. Jost also talks of an exercise lasting for around 15 minutes. This makes the exercises not only seem possible, but also practical. I really like the way this book is laid out. It’s not too heavy on the eye and many ideas are demonstrated on a picture of a kit; for example, orchestrating on the toms and cymbals with particular motions. It looks like the Meinl Cymbals set builder to me, but it’s a nice way of doing it and beats a few crudely drawn black circles. The book talks you through 12 different chapters, each looking at approaching fills in a different way, such as stick shots, flams or just simple 16th notes. Each chapter then delves into how you can experiment and play around with a specific idea and come up with something new, whilst internalising it and absorbing it into your day to day playing. What’s the point of a killer lick that you cannot play when required? At the back of the book is a snare drum exercises appendix, which I found to be a fun way of coming up with some snare drum fills that sound a little more interesting. When you turn right to the back of the book you’ll also find a “reading text” insert, which features 2 bars of 4/4 divided into groupings of notes. This provides a framework from which you can practise the ideas from each section. Jost refers you to the reading text when appropriate and it’s both clear to use and easy to work from. One thing I really like about this book is the endless possibilities it opens up; taking an idea from any section and then applying it to the kit is both easy to do, enjoyable and at the same time you begin to realise just how deep you could actually go if you so wished. It’s another great book from Jost and well worth a look! New Zildjian Cymbals For 2019 – First Look!